Can you believe that next week is already May? West Michigan has had an extremely cold, snowy spring — so it’s just crazy for me to think that the month of May is only a few days away. One idea Dave and I have tossed around for the past year is giving ourselves the challenge of not spending any “extra” money for an entire month. Obviously, this would be a great way to pad our savings account a bit… but it’s also a really good opportunity to reflect back on what we really NEED versus all those things we just WANT. We decided that May would be the month we chose for our “No-Spending Challenge” — and we’d LOVE to have you join in on the frugal fun too (I’ll explain the details below). Basically a month of no-spending can be whatever YOU want it to be. You can be as strict or as lenient as you’d like… because no matter what, a challenge like this will still get you to stop and think about how you’re currently spending your money. Maybe you’ll realize how much you’ve been spending on fast food. Maybe you’ll notice that a huge chunk of your income is going to clothing or entertainment. Maybe you’ll see that you’re doing an excellent job of divvying up your income! So like I said before, you can be as strict or as lenient as you want… but here are some of the ground rules Dave and I have set for our No-Spending Challenge. Obviously we need to keep paying our utility bills, insurance payments, credit card bill, etc… so that money doesn’t count. We would also consider medical bills, car payments, and any other debt payments to fall into this category. 2. Basic necessities don’t count. This category is strictly limited to basic groceries, gas, diapers, and any medical devices or toiletries you absolutely can not function without for the month. To be honest, I have a pretty good supply of diapers, toiletries, and groceries, so I don’t foresee any huge expenses in this category. We don’t want our No-Spending Challenge to negatively affect our investments or our retirement accounts so we will continue to invest as normal throughout the month of May. 4. Business expenses don’t count. If an emergency should arise, we will not hesitate to quit our No-Spending Challenge! 6. Currently scheduled projects don’t count. Dave and I are in the middle of LOTS of yard work (I can’t wait to share more about this later!) As a result of our yard work, we had several companies and contractors scheduled to help us with various projects during the month of April. However, because of the crazy winter weather I mentioned above, most of those projects were postponed until May. So since we’re in a hurry to move forward with these projects, we have decided not to count this money for our No-Spending Challenge. We already had money set aside for yard work, and in many of the cases, we have already paid a “down-payment” and are simply waiting for the companies to come out and finish the job. 7. Using gift cards or store credit doesn’t count. We went back and forth on this point for a while — wondering if we should ban the use of gift cards and store credit for May. However, we ultimately decided that since we wouldn’t be spending any EXTRA out-of-pocket money, that we would not count this towards our No-Spending Challenge. We’ve decided that for the month of May, we will not spend any money out-of-pocket on restaurants, clothing, entertainment, travel, gifts, etc. etc. I’m also going to do my best to eliminate any extra “stockpiling” at the grocery store. This will be a great opportunity to get creative in the kitchen as we eat through our freezer and pantry supplies! Also, we’ll be limiting the amount of driving we do to save on gas. So I think those are all the “rules”. Dave and I aren’t doing this No-Spending Challenge because we’re hurting for money or because we feel like our spending is out of control. We’re simply doing it as a fun way to take a small step back, focus on what’s really important to us, and to see how much we might be able to save by consciously limiting our expenses for one month. We honestly don’t even have a goal for how much we hope to save or what we might do with the money we do save… crazy, I know! I’d love to have you join in on the No-Spending Challenge — feel free to set your own “rules” of course. This should be fun, not overwhelming! Next month, I’ll share some of my thoughts… and the results of our No-Spending Challenge. 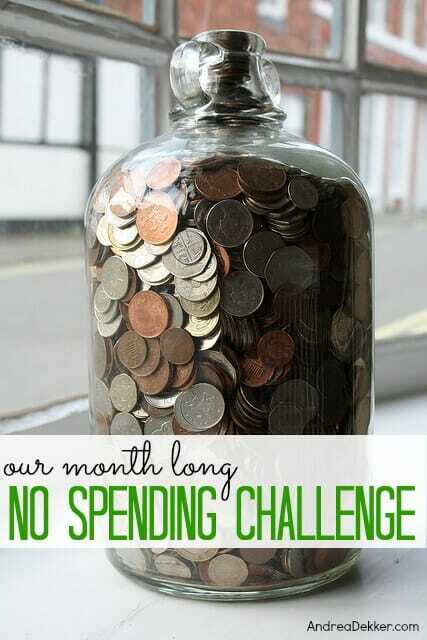 Have you ever done a no-spending challenge? How did it go? Thank you for writing so candidly and thoroughly about money, spending, saving, etc. I’ve only read a few of you posts over the last 30 min. (a friend suggested your site) but I can see you are putting into practice the hard realities of less is more and being a good steward of what God has given. My husband and I give ourselves an allowance to spend on all individual, hobby purchases, and the like. This helps us greatly to think twice before we spend money on non-essentials. We also have a Fun fund for mutual activities like date night and vacations. It works for us and that is what is important – finding a system that works for you. Again, I’ve enjoyed what I’ve read so far. Keep it up! This challenge couldn’t come at a more perfect time for me! I’m a working graduate student and am paying for school out of pocket. I feel like I’ve been overspending for the past few weeks and need to reel it in if I’m going to continue without dipping into my savings. Instead, they can set up some rules of their own, tell their partner/spouse what they’re doing and then keep to their commitment. I’ve used this strategy and while it can be stressful, it can help to model the behavior you want to see in the other person. My husband would never go for a “no spending month”, so thank you foryour comment. I think I will try it on my own. I love this. I am going to consider this today and actually talk it over with my husband and teenagers over dinner tonite. We are a busy family, but we could cut back on out to eat. I have read of different versions of this in the past.A lot of those are very strict and seemed so stressful. I like the plan you and Dave have come up with. We also have some outdoor projects that will take place. The other thing I thought of was OH My flowers!!!! But my favorite nursery here sells Bonds in February. You get a $50 gift card for $35 and you can use it all summer at their store I bought those for upcoming landscaping and for annuals for my deck and porch. I think we are in: focusing mostly on out to eat expenses. We do have a Home Goods opening up next weekend. OOOOHHH NNOOO! 🙂 Thanks again for a great post with great inspiration. Wow Debby, I would love to have a place where we could get $50 gift cards for $35 — what a great idea! And about the challenge, I’m all for “keeping things simple” so feel free to be as “tame” as you’d like for this challenge. Start small — it’s better than nothing at all! Good luck! Can’t wait to hear how it goes! I’m in! Thanks for the inspiration and challenge! Yes Rebecca – feel free to make your own “rules” for the challenge. The idea is simply to take a step back and be more intentional about how you’re spending your money. Not eating out for the entire month sounds like a great place to start! I really like the idea of a month long challenge, I really do. But, May is a tough month in the area of gifts: Mother’s Day, end of year gifts for teachers, graduation gifts, wedding gifts, several birthday gifts. Andrea, do you have a stockpile of gift cards you use for gifts? Kim, we honestly don’t have many gifts to buy in May. We have no birthdays, no weddings, no teacher gifts, and since we get invited to TONS of graduation parties for Dave’s students, we don’t give gifts (that’s normal for teachers in this area). We are going to take the challenge with you. As soon as that tax money goes into the bank it’s like we forget that we had plans for it. This is a perfect month for this:) Thanks. Yay!! Hopefully we’ll both enjoy some extra savings! Uh oh. May is Mother’s Day! Dave is getting off easy this year :). I would love to join in this one, but it will have to wait until another month. Lots of extras in May that we actually planned for, but aren’t necessary. I will enjoy hearing about yours, though. How does garage sale shopping fit into your plan since we are just starting to see the garage sale signs pop up? Haha — Dave isn’t a big “gifts” person so I’ll probably get a homemade mother’s day card from him and Nora. I’m OK with that because I don’t need anything and Nora is still too young to really understand gift-giving. And good question about the garage sales. I honestly didn’t think about that 🙂 We honestly don’t NEED anything so I’ll probably just steer clear of garage sales for the month — I think Craigslist will be more difficult for me! I have been wanting to do this for at least a year, but was never sure exactly how it worked. Thank you for spelling out the “rules”! Looking forward to saving money, as well as seeing how much extra we spend because we “think” we need to. Thanks Barb — but remember, you can make your own “rules” so don’t feel like you’re stuck to our “rules”. This is just what Dave and I decided would be best for our situation! I did this for Lent as was very successful. I couldn’t believe how much money I saved! It was a tough, I have to say but I definitely plan to have non-spending months again. Not in May though. . . to soon. Lol. Good luck! I have also been thinking about trying this challenge out for awhile so its nice to have someone to do it with! I plan on cutting down on my grocery spending as well and eating out of my freezer and pantry. Good luck! I have been wanting to do this challenge for about a year now. What better time to start and join the challenge with someone else! We have been doing the Dave Ramsey plan for a couple of years now and what a difference it has made in our lives! But over time, I feel myself slipping a little. We are still sticking with our plan and this will be great encouragement to tighten the reins and move forward! I think this is a great challenge. Living in Canada, I find that something as simple as buying groceries can be a huge challenge in and of itself. Yes, the prices have skyrocketed everywhere, no arguments there. One thing I would like to see here in Canada, is the same type of Coupon system you have in the states. We have nothing that even comes close. Trying to save on groceries can be impossible. Random in store sales are the best we get. Doing a challenge like this is motivation for me to come up with some extra money FOR stockpiling the freezer. Great Idea!! I’m with you Barbara! I’m also working to change my life before I’m 50 (March, 2014). Losing weight via My Fitness Pal, (I’m nutfish1 – friend me if you’re on MFP), stoking the retirement funds as much as possible and paying off debt. I use the envelope method for all of my groceries, gasoline and spending money every week. It really has been helpful in making me re-think if I need something vs if I want something. If I know I only have $100 to spend at the grocery, I really think long and hard about the pint of ice cream or the cookies!! My husband and I had taken the FPU class a couple years ago and had tried the envelope system as Dave Ramsey suggests but I hate to admit that we got lazy and unfortunately we fell off the band wagon. Just within the last couple of weeks I have been trying to incorporate this again to try and tighten the reigns on our spending. Little did I know that it would soon become a necessity because just today my husband found out that they are closing the factory he works at as of June 30th…what an eye opener – so this challenge could not have come at a better time!! Thank you so much Andrea for being such a great inspiration for so many people…my hats go off to you and this great site! !